Developed by a team at the University of Toronto, mROBerTO (milli-ROBot TORonto) is designed for swarm-robotics researchers who might wish to test their collective-behavior algorithms with real physical robots. 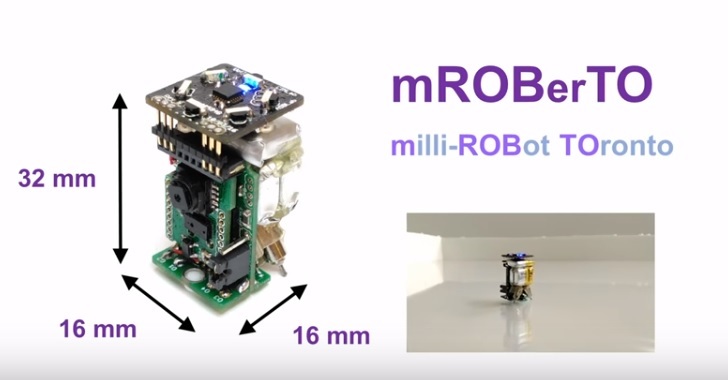 With just a 16 mm x 16 mm footprint, mROBerTO can be used in a multitude of other miniature robot projects too—its modular design allowing for easy addition or removal of components. mROBerTOs can determine any nearby robots’ relative distances and bearings by their unique robot IDs (up to 150 mm sensing radius) with the use of modulated IR signals. To achieve this, mROBerTO has an all-around coverage of IR phototransistors and emitters that can receive and send modulated IR signals. Furthermore, mROBerTO is equipped with Bluetooth Smart and ANT Wireless communication capabilities, which allow point-to-point and mesh network communication among robots. As for movement, there are two small motors located at the back of the robot that act as wheels and move the robot in a differential-drive configuration. The majority of swarm robotics research has so far been limited to running virtual simulations for the purpose gathering experimental data. In order to test swarm behavior algorithms in a more realistic setting, we have to use physical robots in an environment where real-world constraints act upon the experiments. However, a swarm will often consist of tens—even hundreds—of robots operating together. So robots should ideally be as small as possible if these swarm algorithms are to be tested in a lab setting with limited work-space. And since we need a large number of these robots for experiments, we should aim to use only off-the-shelf components for easy assembly, production, and maintenance. In addition, certain swarm algorithms may require special sensing capabilities in the swarm robots, requiring modular in-design to allow quick exchanges of processing and sensing hardware. mROBerTO was designed to address these specific issues. At the moment, there are no commercially available mROBerTOs. The BoM costs approximately 60 USD, and the source files of both the hardware and software can be provided by the developers. mROBerTOs were developed using the Eclipse IDE with SEGGER J-Link programmer/debugger but any integrated development environment that supports ARM GCC can be used to develop on mROBerTOs. For wireless debugging and development purposes, we recommend the user getting an nRF51 or nRF52 development board to wirelessly communicate with mROBerTOs. mROBerTO was developed by Goldie Nejat, Justin Y. Kim, Tyler Colaco, Zendai Kashino and Beno Benhabib at the University of Toronto, Department of Mechanical Engineering. 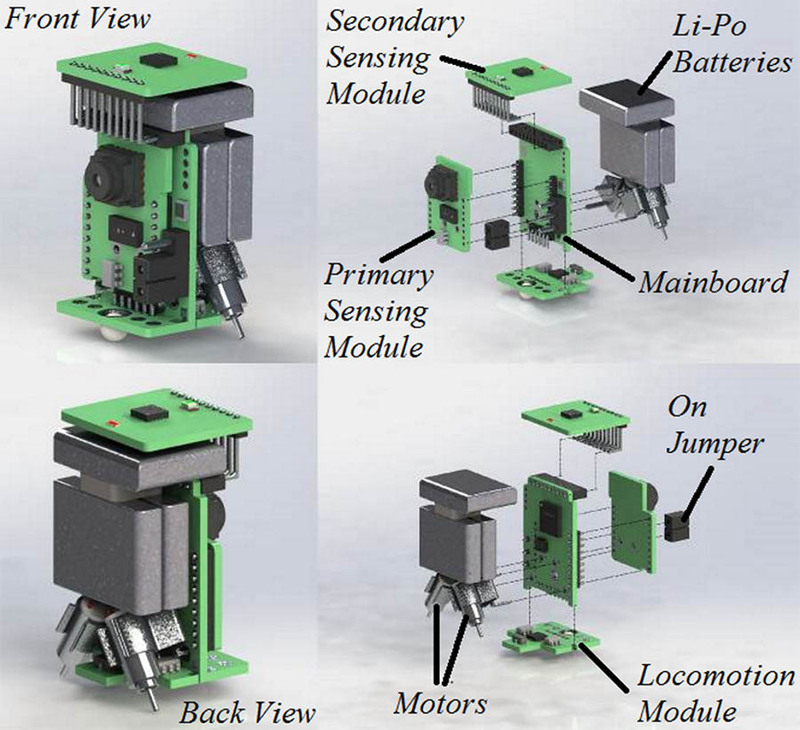 The latest version of the robot was completed in June 2016 and first featured in 2016 IEEE/RSJ International Conference on Intelligent Robots and Systems (IROS) as ‘mROBerTO: A Modular Millirobot for Swarm-Behavior Studies’.